Food waste is a national issue that not only affects households and businesses across the country but will leave its mark for generations to come. I, like many great chefs and restaurateurs, have finally woken up to the issue of working responsibly and ethically and taking some ownership of how we operate. We are by no means perfect, nor are we finished with our crusade—but we are certainly giving this vast subject the thought that it deserves. Do understand, we don’t throw food away—this is a business after all, but we do boil chicken bones and discard them after extracting their inner deliciousness; we peel onions, de-shell scallops and oysters; remove the outer leaves and orange peels. These incidentals all add up to a whopping 300 litres of food waste across my three restaurants every day! This wasn’t good enough. We researched and talked to our friends at the Ledbury and now adopt the same process. We now work with a brilliant company called Indie Ecology, who collects all of our food waste across our three sites daily. The waste is then shredded with wood chips and poured over warmers and cooked into compost out in Bretford. After three weeks that amazing fertile, bubbling compost is ready to be shipped to Sussex where it is laid over older compost and never ploughed. We buy around 10k of seeds annually, interesting things we want to grow and use like fennel tops, alexanders, white beetroots, rainbow chards, Jerusalem artichokes and flower seeds for the tables. The team at Indie Ecology plant and nurture the seeds, all of which grow at an alarming rate on our wild compost. We receive deliveries twice weekly of the most beautiful vegetables that we have a genuine connection with. We love them so much that we have salads and vegetable dishes running throughout the year in all three sites that use 90% of food from our garden. To see what beauty can be garnered from such dull looking waste is inspirational. I live in hope that one day Indie will be the way of the world; everyone’s food waste will be collected and composted in return for stunning fresh vegetables. Responsible nutrition for the soul we call it. 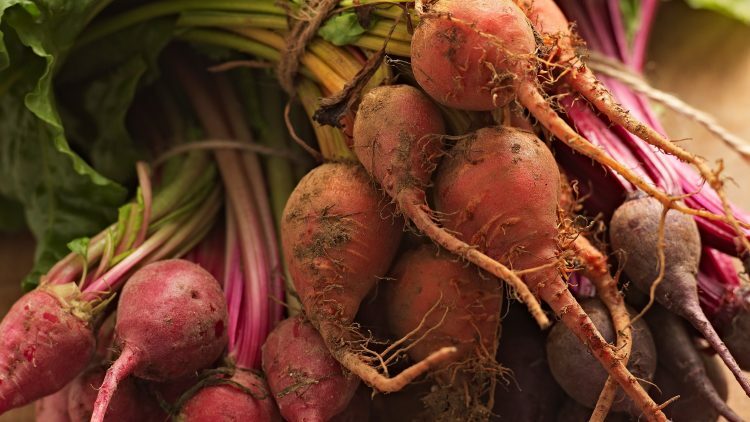 Here’s a great recipe for Sweet and Sour Baked Beetroot we make using some of the stunning fresh vegetables.